The scene in Bridge Street after the attack in August last year. 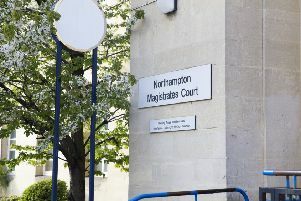 Northampton Crown Court heard how Louey Kostromin, 37, of no fixed abode, attacked two of the officers who had arrived at a probation office in Bridge Street, Northampton, to take him back to prison. Kostromin had breached the terms of his early release from jail for a previous offence by turning up late for a probation appointment. So, on Monday, August 6 last year, probation officers told him he would be returned to jail. He had been described as ‘agitated’, but by the time the police arrived, it was believed he had calmed down. Appearing before Judge Adrienne Lucking on Friday (April 12) , Kostromin’s 37th birthday, the defendant was found by a jury to be guilty of wounding with intent. He had admitted wounding but denied that he meant to cause serious harm. During her instructions to the jury, Judge Lucking described how the defendant hit one of the officers in the jaw before biting down on another police officer’s ear for about fifteen seconds. He then bit on his arm while colleagues tried to prise him off with ‘his legs and arms thrashing around’. Police officers, who captured the incident on their body-worn cameras, tried to get Kostromin off their colleague and eventually had to surpress him using pava spray, after kicking out at him and punching him did not stop him. The court was told that Kostromin was ‘desperate’ and did not want to return to jail. He said he had not slept for 72 hours and had been hallucinating. He told the court he ‘thought he was going to die’ when he was arrested and did not remember the attack. He said it was ‘absurd’ that he had thought about what he was doing at the time of the attack. Kostromin was remanded in custody and will be sentenced in June. The police officer who had his ear bitten off was said by Chief Constable Nick Adderley last year to be making a good recovery following surgery.